Perry is in the heart of Western New York, at the gateway to Letchworth State Park, the Grand Canyon of the East...and steps away from the shores of Silver Lake and its famous Sea Serpent. Seasons speak here, from fall foliage at Letchworth State Park to boating, swimming, and ice fishing at Silver Lake...the sea serpent...mini golf, cruise nights, and live performances at the Silver Lake Twin Drive-In and Charcoal Corral. Come explore, and be surprised at what you find! Chalk Art Festival & Taste of Summer with the Farmers' Market! 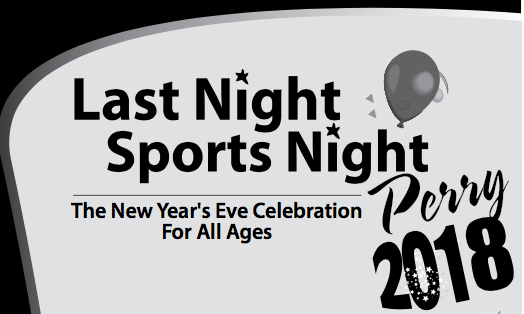 Looking for a different event or date? Check the full calendar to find more event listings! This annual tradition never disappoints. With events and activities that range from music and the arts to active games and sports activities, there's no shortage of fun to be had. Check out the 2018 schedule of events! This exciting new festival will feature international traditional & contemporary puppetry is coming from June 14-24, 2018. Ten days, over 30 artists, 19 shows, 5 public workshops, 1 puppet art exhibition, 1 puppet film screening, 1 panel discussion, post-show Q&A with artists, opening & closing receptions! First glimpse information in the event posting and at www.newyorkstatepuppetfestival.org. The New York State Puppet Festival is presented by Josh Rice Projects and supported by grants from WCRAI and ACWC. Sponsored by the Perry Main Street Association. This project has interesting, exciting 'quality of life' and recreation impacts. Silver Lake Feasibility Study project documents are posted on the village initiatives page. You can download the documents from the Open House Information session with concept sketches, drawings and other information there. Learn more about this new collaboration opportunity between Perry, Mt. Morris and Geneseo on the village initiatives page. The Village of Perry has established a Tree Advisory Board to develop a master plan for the village trees. If you have questions about village initiatives, reach out to the village, or contact us. We'll route them for you. These banners were added to the new lightpoles in Spring 2017. They follow the same themes and design as the original community banner series, produced in 2011. This new set is sized for the new light poles installed on Main Street in 2016. When you see a Rotarian, be sure to say thank you for funding this new group of banners. 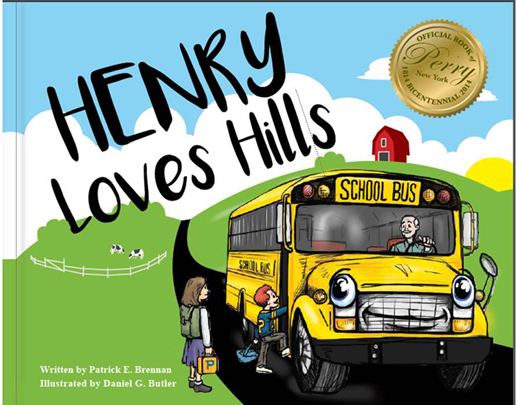 Henry Loves Hills is Perry's official book written by Perry native Patrick E. Brennan in response to a competition organized by Read Around Perry, a Rotary-initiated community literacy program with support from the Town of Perry Bicentennial Committee in 2014. It tells the story of a school bus, named Henry, who negotiates the beautiful rolling hills of Perry bringing children to and from school everyday. Henry, and driver Ed, confront and overcome their biggest challenge taking readers on a trip through a major snow storm. Sally Snowplow helps out. Brennan, who graduated from PCS, based Henry Loves Hills on his experience of a bus ride during the infamous Blizzard of 1977. Dan Butler, a Village of Perry resident and 2015 Perry Chalk Art Festival featured artist, is the illustrator. For more information about Henry Loves Hills, contact readaroundperry@gmail.com. Letchworth State Park has a Perry entrance, just east of downtown. The "Grand Canyon of the East" was voted the #1 State Park in the US in 2015, and includes spectacular 500-feet deep gorges carved out by prehistoric glaciers and the north-flowing Genesee River. There are trails for hiking, biking, walking, snowmobiling, and cross-country skiing, guided nature activities, canoing and kayaking, camping facilities, cabins, and a historic restaurant and Inn. Silver Lake, southwest of downtown, is not just home to the legendary sea serpent, but is also a popular destination for boaters, fishermen, and visitors. Along the water's edge, the Silver Lake Institute contains hundreds of year-round residents, many living in a dense, pedestrian-friendly neighborhood filled with historic East lake Victorian cottages. Near the Institute are an art gallery, several performance halls, a public dock and beach, and the historic Pioneer Grounds (a living museum). Other nearby amenities include a campground, several marinas, a country club and restaurant, and the Charcoal Corral/Silver Lake Twin Drive-In, a popular seasonal establishment. At the south end of Silver Lake lies Silver Lake State Park, a natural retreat with a boat launch. What's missing? Perhaps just you!